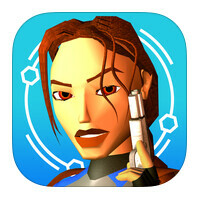 Did someone say "Tomb Raider 2" for iOS? Well, here it is! It was only 3 days ago, when we mentioned Tomb Raider 1 for iOS in our discounted must-have games thread, and it seemed like some of you guys are interested in seeing more of Lara's original adventures ported to mobile in the future. Well, look at that – hours ago, Sqare Enix published Tomb Raider II on the app store and it's up for grabs for $1.99. Some of you may be unfamiliar with the original titles, others may be in for some nostalgia shots – either way, the game is a must for lovers of action-and-exploration titles with a certain degree of challenge to them. Yes siree, Tomb Raider II hails straight from the 90's – the era of gaming, where health wasn't self-regenerating and the camera did not constantly point you in the direction you need to go – if you wanted to find your way to progress in a level, you actually had to look for it. And there's a lot of looking to be done in the classic Tomb Raiders, as the titles are more Indiana Jones-inspired and less modern-action-game-wannabes. Either way, we'd recommend playing with an MFi controller, as touch is bound to cause some rage on more than one occasion. And if you're not sure about shelling out $2 on this title, the first game is still discounted and available for $0.99 – we'll link it below as well. Sorry, Android gamers, but there doesn't seem to be a hint that these games will be dropping in the Play Store any time soon. But who knows? Nice addition to App Store. Should be released to android too!! There's absolutely no need for it, as PSOne emulators do exactly what that app does and much more. This reminds me, I have tomb raider for Xbox one that I need to play. It is just sitting there.